The absence of strong men has had a profound effect on the youth of today. As troubling as these statistics are, however, all is not lost. We don’t have to look far to find the perfect blueprint of a great father – we need only look to God Himself and the blueprint found throughout His Word. If we can integrate these traits of God into our lives, we will not only be good fathers, but we will be great, godly fathers. A man who loves his family invests physically, mentally and spiritually into their well-being. Love requires a sacrifice and men are often called upon to make sacrifices for the betterment of their families. God gave His only begotten Son to reconcile His most prized possession back to Himself (1 Corinthians 5:18-19). Love is unconditional and doesn’t place stipulations on the recipient (Romans 5:8). Love challenges us to invest into and train up our children to give them hope for their future (Proverbs 22:6). Without love, we cannot be or become godly fathers. In this day and time, image is everything. It’s not just a slogan, but a holy image should be a way of life for men of God. Godly fathers walk in integrity and provide their children with a model of godliness that they can follow (Proverbs 20:7). Godly fathers put childish actions behind them (I Corinthians 13:11) and strive to walk worthy of being called a father (Ephesians 4:1). Our children are monitoring what we do, what we say, how we lead and how we react. They can see if we’re being real or fake. 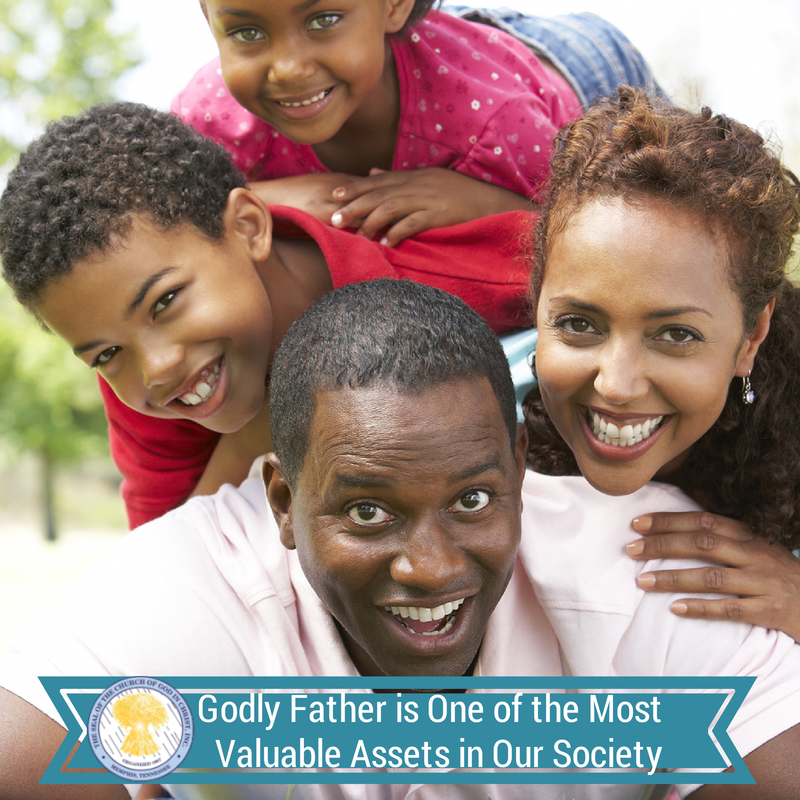 Godly fathers portray an image of holiness and integrity. Godly fathers bring stability into their homes by being consistent. It is hard for children to focus when fathers are inconsistent in their actions and interaction. My pastor fondly recalls how his father “put manhood into him” by teaching him work ethic, maintaining discipline in the home and practicing what he preached. Godly fathers are focused and are not unstable (James 1:8). Godly fathers are trustworthy, building confidence and strength in their children and family as a whole (Psalm 37:3-5). Patience, compassion and longsuffering are not common traits for men when it comes to our children, but as we grow in Christ, they should become qualities of godly fathers. Our quick tempers yield foolish decisions and results, but patience shows wisdom and understanding (Proverbs 14:17, 29). Our words can build up or destroy, so patience allows us to breathe life into our families no matter the situation (Proverbs 18:21). Men who rely upon God as the source of their strength create a fortress of protection around their homes, providing their families with peace and security. God urged Joshua to be strong (Joshua 1:6) and Paul encouraged the church at Ephesus to be strong (Ephesians 6:10), but it was all based on God’s power and might, and not their own strength. Without God, we’ll always fail, but with God, all things are possible (Matthew 19:26). Godly fathers rely upon God to help them protect and support their family. Before we were born, God knew us and shaped us for this day and time (Jeremiah 1:5). Godly fathers mimic the traits of God. If we can follow in the footsteps of God our Father and apply His Word to every aspect of our lives, we can change the lives of our children, our children’s children and the world at large. Thank you Elder McCown. It's amazing how God works. On Mother's Day my wife invited our District Missionary to come and deliver the message. She read St. John 3:16-17 as she began her message. While sitting in the pulplit listening to the messagae, God dropped the thought "A Father's Love" in my heart. This is so consistent with what I believe God has given me to share tomorrow as we celebrate Father's Day. I received this as confirmation. Thank you.